In the Cambridge Cemetery there are already thousands of potted family histories, a garden and an art gallery of headstones and statues. But the unmarked gaps between the headstones are the most tantalizing. The 3rd Regiment of the Waikato Militia were the first European inhabitants at Cambridge. They moved from the Pukerimu redoubt just after tenders were called for the erection of huts on 28 July 1864. In the ‘remarks’ column of their Nominal Roll the deaths of 45 soldiers are noted. 22 of these deaths are not on the General Registrar’s Index. The Auckland newspaper, The Daily Southern Cross, sent a correspondent to report on daily activities. On 4 June 1864 at Pukerimu a soldier of the 50th regiment shot himself and in September Sergeant Slattery of the 18th Irish slipped while leaving the paddle steamer and drowned. Slattery left a wife and child. Jonathan Dann was the first death at Cambridge. The entry in the General Registry reads – Died on 25 September 1864 at Cambridge; a male aged 27; occupation a Waikato Militiaman; died of Apoplexy. Archives Wellington has the Inquest J31 1864 1442, which says, he was very drunk and ordered to his tent. The verdict was “Apoplexy fit brought on by excessive drinking of ardent spirits”. The Waikato River at Cambridge has always been treacherous and the next three deaths were all drownings. First, Frederick Higgins, 23 November 1864 and reported in the Daily Southern Cross -“A young man, who was partially if not quite intoxicated would bathe in the river, although told not to do so”. Later- “The Forest Rangers fired three volleys over the grave, it was a sad end for a young fellow after going through all sorts of hardships and perils, to come here to be drowned”. The New Zealand Herald also reported on Cambridge activities. Ernest Augustus Hartman drowned 4/5 December and David Halliday 13/14 December. Buckley (identified by his clothes) was found hanging in a tree by surveyors, having deserted under peculiar circumstances from the regiment in late December 1864. In 1865 Cambridge became the registration point for the Waikato district’s birth, deaths and marriages. Previously these were registered in Drury. In 1869 Te Awamutu got its own registration district and Hamilton North in 1870. James McKearney (aged two when he came to Cambridge in 1864) had recorded in the Waikato Independent 27 June 1936 what he remembered as the first funeral to be held in Cambridge when the young daughter of Sergeant Diver was buried on a section in Duke Street. Elizabeth Diver was found in reference J 1 1641 1865 at Archives Wellington. An inquest had been held at Camp Cambridge 16 October 1865 for Elizabeth, 4 years 9 months lying dead at the house of her father Frank Diver, military settler in Cambridge. His wife went for Dr Seth Sam. A native (Mere Takua) examined the child and said through an interpreter that she had eaten a poisonous herb but was too far gone. She gave the child salt and water and said that if she had been there before the third fit and given her salt and water she would have cured the child. She nursed the child in her arms but knew she was too far gone. The child became speechless with teeth clenched and died at 4 a.m.
Robert Wilson died 4 July 1866 (choked on a piece of steak while drunk) and the report in the Daily Southern Cross states specifically that he was buried in the cemetery on the right bank – Cambridge East. He left a wife in Melbourne. The first burial recorded at the Cambridge Cemetery on a headstone is Dugald Charles Edward S MacColl. He died 6 August 1866 and his wooden memorial, erected by his brethren of the Lodge Alpha, can be seen beside the front gate. 24 May 1869 is the earliest date on the stone headstone of Eliza Ewen. She was the first wife of Chapman Ewen who died of paralysis age 52. In 1867 the 3rd Waikato Militia was disbanded. The Armed Constabulary took over commanded by Lieutenant-Colonel William Moule with Headquarters in Cambridge. The General Registry records that in January 1872 James McQuick died from ‘coup de soleil accelerated by drink’; William Reynolds was accidentally killed [when his horse reared up and landed on him]; and Thomas Verran drowned [along with his horse, in a whirlpool at the mouth of the Cambridge (Karapiro) Creek]. Benjamin Heaslip died of a hernia, age 7 weeks. The Waikato Times newspaper (on film in the New Zealand room of the Hamilton library) started in May 1872 and the Cambridge Correspondent elaborates on local activities. Arthur Laurence age 17 months died from the effects of sucking the heads of Lucifer matches. The Cambridge police Charge Book records in April 1873 that Timothy Sullivan was murdered by four Maori – the last death in the district connected with the Waikato land wars. And Alex Williamson drowned at Cambridge on 20 October 1873. J & G Buchanan Stone Masons have stamped their mark on the headstone of William Clements who died 30 July 1873 but many impressive works are anonymous. Some of the marble statues were imported from Italy with local masons providing the bases and script. William Dow’s headstone records that he was the “younger son of the late William Dow of Kirktonlees, Auchterader, died at Cambridge NZ, 16 July 1875 age 25”. The next headstone records the death of John Hally in 1904 and his wife Helen in 1906. And a look in the Probates in Auckland Archives pointed to the fact that William Dow and Helen Hally were brother and sister. In 1876 more information was entered in the Registrar General’s registers and for the first time the place of burial was recorded. We know for certain that Philip O’Connell a shoemaker of Cambridge was buried in the Cambridge Cemetery on 7 January 1876 with David Richardson as undertaker. 26/01/1876 – Mrs [Mary] Bate of Cambridge died suddenly – inquest not required. (Mary Bate is one of the first to be recorded in the St Andrews Anglican Death Register still held at the Cambridge church). 27/02/1876 – Mary child of Chas and Mary O’Neill died. 15/06/1876 – Child Coleman [Coltman] age 8 weeks found dead in bed 7 a.m. At an inquest for Robert Henry [Coltman], a verdict was returned “died by the Visitation of God”. 14/09/1876 – Died suddenly at Cambridge at 4 a.m. [William] SHAW. Joseph McCafferty’s death is recorded on 22 March 1883 in the Armed Constabulary diary in Auckland Archives and a copy of a letter sent to his sister Mrs Frances Franchi, was found in Wellington Archives . From 1878 the Cemetery Trustees kept minutes [Cambridge Museum] and it is recorded in November 1879 that “Mr W M Shaw be appointed gravedigger if he binds himself not to charge more than 10/- each grave”. The Trustees charged a further 10/- for each allotment and it was up to the undertakers to keep a burial register. In July 1880 Rev J Golden made application to the Cemetery Trustees to set aside a separate area for the Roman Catholics and they were allocated 102 plots. There is no obvious plan to the earlier burials. Perhaps a plot with a good view or under a shady tree could be reserved. It seems more out of convenience than design, that a carpenter or joiner doubled as undertaker. He usually had a wagon and the ability to construct a coffin. About 1890 George Dickinson incorporated ‘undertaking’ in his stationery business. He advertised as Funeral Director and Embalmer but he (and his son in law who followed him) did not keep good records. The Cambridge Borough offices had a fire 23 July 1900 and only the reconstructed map survives from this earlier era. The local council’s burial register was not started until 31 December 1909 and by 1926 the Sexton had to take extreme care to prevent the disturbing of graves in the old section. After World War Two the Returned Services Association section was established at the Cambridge cemetery. A Wall of Memories was built and a Roll of Honour with 164 names inscribed on the archway for those who had lost their lives in World Wars One and Two. An index in Wellington Archives points the way to burials of New Zealand’s war deaths. Members of the NZ Society of Genealogists fortunately transcribed the headstones in 1975 as Council had a ‘tidy up’ in 1983 when headstones, concrete slabs and wrought iron fences were removed. But the Cambridge cemetery continues to open up more of its 21 acres, providing a peaceful resting place and recording more and more family histories. Inquests – Eliz Diver was found in reference J 1 1641 1865 at National Archives in Wellington. It is recorded that an inquest was held at Camp Cambridge 16th October 1865 for Elizabeth, 4 years 9 months lying dead at the house of her father Frank Diver, military settler in Cambridge. The Waikato Times – report on the funeral of Harriet Laird who died 1 October 1875. “The funeral of the late Mrs Laird of Cambridge on Sunday was attended by nearly 400 persons including 40 carriages, 100 horsemen and the Odd Fellows in mourning regalia. The corpse was conveyed in a waggonette draped so as to resemble a hearse, the horses also wearing funeral trappings. Rev S J Neill read the service impressively”. 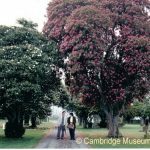 Click here to see the list of pre-1910 burial Registrations held at the Cambridge Museum.